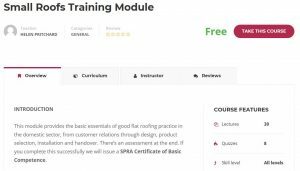 The Small Roofs Training Module will test your knowledge and understanding of basic single ply roofing. It is best to go over the sections until you are confident that you have understood and learnt all of the material in that section before you take the Assessment Test at the end. Use the menu on the left, or the PREV and NEXT buttons at the bottom of the screen to move between sections. You must complete and pass (>80% correct answers) all 9 section assessments in order to pass the course and achieve a certificate. If you do not pass the Training Module, you can re-take it, but you must have completed the whole course- ie all 9 sections. You cannot re-take individual sections as you go. We recommend working through all of the training information in each section until you are confident of passing each section before moving on to the next. Need more help? Please watch the video below before going to the Training Module. Good luck! Copyright 2017 Single Ply Roofing Association Main website.